← Is methane a ‘better’ greenhouse gas than CO2? Prof. Don Easterbrook has a piece Global Cooling is Here:Evidence for Predicting Global Cooling for the Next Three Decades that has been getting some attention in the blogosphere in which he claims that global warming has ended and that global cooling will occur over the next several decades. Easterbrook’s analysis is hopelessly flawed, and one is left to wonder just why he would intentionally shoot down his own credibility with such sloppiness. Any support of this work on internet sources is not a support of any actual science or data, but an appeal to authority. Despite no global warming in 10 years and recording setting cold in 2007-2008, the Intergovernmental Panel on Climatic Change (IPCC) and computer modelers who believe that CO2 is the cause of global warming still predict the Earth is in store for catastrophic warming in this century. This type of language is not used in the IPCC report, and strawman attacks won’t change that. This sort of wording is a clear indicator that you are reading propaganda, not science. If high-schoolers use this type of language in an essay I might let it slip, but for people who are supposed to be taken as an authority on a subject, it is an instant shot on credibility and a good sign the writer has an agenda. Yet this needs to carry some sort of uncertainty attached to it. “By 2100” is a mark that not only carries with it the uncertainty attached with climate science, but the question marks of future emissions which involve political and economic uncertainty. This number could be substantially lower if man decides to act on fossil fuel emissions. All of this is predicated on the assumption that global warming is caused by increasing atmospheric CO2 and that CO2 will continue to rise rapidly. Radiative transfer is not an “assumption.” The physics is not the most easily understood thing, but it’s not very hard to learn why more CO2 must cause additional warming. Scientists did not just pull “CO2” out of a hat, or throw it in the mix because nothing else worked. The infrared absorption properties are undisputable. However, records of past climate changes suggest an altogether different scenario for the 21st century. Rather than drastic global warming at a rate of 0.5 ° C (1° F) per decade, historic records of past natural cycles suggest global cooling for the first several decades of the 21st century to about 2030, followed by global warming from about 2030 to about 2060, and renewed global cooling from 2060 to 2090 (Easterbrook, D.J., 2005, 2006a, b, 2007, 2008a, b); Easterbrook and Kovanen, 2000, 2001). Climatic fluctuations over the past several hundred years suggest ~30 year climatic cycles of global warming and cooling, on a general rising trend from the Little Ice Age. This makes no sense. Essentially what Easterbrook is doing is attempting to use the historical paleo-record as a template for future change, while a) assuming that anthropogenic influences are indeed not going to be a factor, b) not discussing the causes of the past climate fluctuations. Historical records for the little ice age to present aren’t much good for predictions if you know the underlying system is changing, and using this to extrapolate into the future is absurd– really, a tenth grader would know better. The little ice age involved solar and volcanic influences, while the modern warming trend is something else and that something else will change over the coming century. What historical records may be good for is for constraints on climate sensitivity, constraints on the magnitude of internal variability, but they say nothing about the attribution of modern change or how external forcings will change. This paragraph contains mischaracterizations of those previous climate changes. For one thing, the global average never changed by 10-20 degrees in decades, and certainly nothing of that extreme in the past 15,000 years. 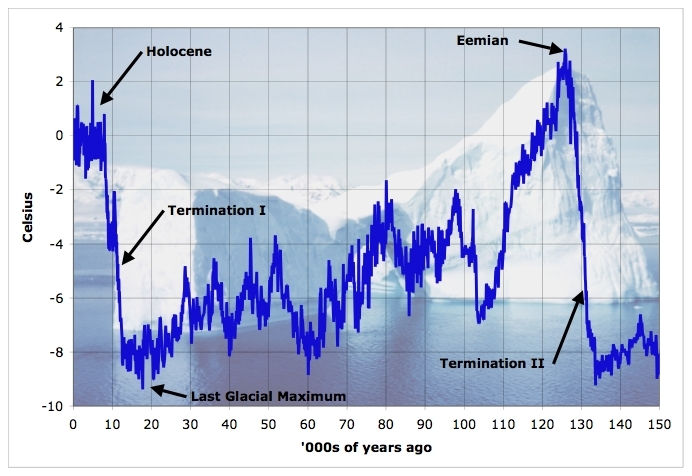 The graph used by Easterbrook looks at temperatures in Central Greenland, which were indeed marked by many abrupt changes during the last glaciation. The causes of these large temperature jumps is mostly a question of change in how heat was moved around the climate system, which is different than a global-mean temperature increase which was probably much closer to zero than it is today. This is the “see-saw” pattern between the North and South as a result of changes in ocean circulation. As far as our understanding is concerned with these events, these are exclusive to glacial conditions and there is no evidence of any strong signal in the Holocene, including today. Since then, we are in a permanent warm state, which is similar to a permanent Dansgaard-Oeshger event. The Holocene has a different pattern of ocean circulation than glacial times with convection in the Greenland-Norwegian Seas, and small variations of fresh water input will not accumulate. Any suggestion that these patterns are responsible for the warming up until 1998 needs to be shown, not speculated upon, because it contradicts almost everything we know about greenhouse physics AND those previous oscillations. Concerning how it was impossible for atmospheric CO2 input from humans to have triggered these changes, duh. 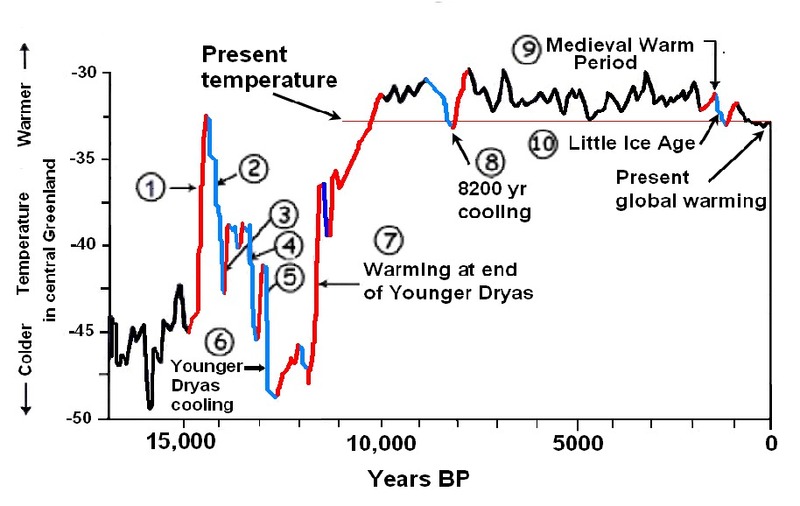 No one thinks that temperature cannot change without CO2 being involved, just that the converse is not true. The next part of this article mentions glacier advances and retreats in one part of the world, but this is irrelevant to the reality of AGW or his alleged future cooling. Now a decade later, the global climate has not warmed 1° F as forecast by the IPCC but has cooled slightly until 2007-08 when global temperatures turned sharply downward. In 2008, NASA satellite imagery (Figure 6) confirmed that the Pacific Ocean had switched from the warm mode it had been in since 1977 to its cool mode, similar to that of the 1945-1977 global cooling period. This is an additional 45 points from #26 and #36 in “Quantifying Skeptical Arguments.” The 2007-08 “cooling” lasted a couple of months and had to do with a La Nina. That’s called weather, and we expect weather even with an underlying AGW signal. Trying to use this as some evidence of a coming cooling trend is delusion at best. There is no evidence to suggest a switching of “warm” to “cool” phase will alter global mean temperature, for the reason that again, the PDO is an internal mechanism that moves heat around, it doesn’t add heat to the climate system. The PDO itself is defined as not having a trend, but during the ‘warm phase,’ the majority of the Pacific is actually cooler than normal. These terms have more to do the value and are “names” rather than physical descriptions of what happens. Easterbrook would have us believe this is all responsible for mid-century “cooling” while ignoring aerosols, volcanoes, or anything else. Secondly, the IPCC projected about 0.2 C/decade, but over time intervals of a decade this has an uncertainty which is roughly the same as the projection value itself. For instance, at Gavin’s post on what IPCC models really say, he writes: “For 7 year trends (beginning of 2001 to end of 2007), the model spread is approximately N(0.2,0.24) in deg C/dec.” This notation means that the mentioned period has a mean of about 0.2 C/dec and a standard deviation of 0.24 deg C/decade. There would be slightly less for 10 years. A predicted 1 degree F rise is imaginary and not found in the latest IPCC AR4 report, but just as bad, there is no range of error to account for natural variation. In short, there is absolutely no science in Easterbrook’s article, and much of it is based on misrepresentations of the IPCC and ignorance of the climate system he is analyzing. His implication that a changing PDO almost assures us for a coming cooling period is just wishful thinking, but he doesn’t understand the difference between a “signal” and “noise” or what the PDO actually does. He effectively assumes that greenhouse gases have had minimal impact, and will do so, without quantifying this argument. As such, there is no basis for his conclusion that global warming is over and that global cooling is awaiting us. The funniest error is that in all his graphs of the Greenland temperatures he has mislabelled the LIA and MWP (they are at least 1000 years off). Nice analysis, Chris. I’m sure I’ll have many (all too many!) opportunities to refer back to it at globalwarming.change.org. “Don” not “Gregg” – two very different people! Sorry, but global cooling has been happening since 2002 and has not stopped. The solar decline and PDO-AMO changes of phase will also cool global temps. The correlation of increasing CO2 and Global Temp fall is the opposite for the last 9 years since 2002. If CO2 has the 90% effect that you and IPCC say then such 9 year periods of cooling are not possible, and incidently, the Easterbrook graph is clearly labelled in Central Greenland if you really looked at it properly! I wonder how long the cooling can go on and the global temperature trace not follow IPCC projections before you folk will awaken, or more likely it will go on for the next 20 to 30years or more and you still will not be convinced for your minds are so made up that they will never change I fear! Response– Pointless. There is no such thing as “9 year climate” so using a time period roughly 1/3 of an accepted climatology to evaluate a *climate change* makes no sense. You’re convincing yourself that “9 year cooling” is not possible yet there’s no reason it shouldn’t be, since (as you agree), natural variability exists and the greenhouse “signal” is not that strong over such a short amount of time. If there is cooling for another 10-15 years, you might have a point. Well I have done extensive research into the whole affair and made up my own personal model which convincingly shows to me that solar and ocean changes are the principal climate change drivers around the globe since 1900, and CO2 is but a minor player in the whole affair. The CO2 correlation shows for small periods, and as it goes up in almost a straight line, of course it will, if global temp rises for periods. However, solar and ocean changes mirror almost all the temp changes almost all the time convincingly. And in the next 20 to 30 years the forecasts are for lower solar output and cooler ocean cycles. That is enough proof for me. (Volcanic eruptions are the only other factor of note, but who can predict them…….You believe as you wish, you are entitled to do that, and so am I…….But at least I have openly looked into it all and not blindly accepted an uproven theory…….We shall all see before too long anyway who is on the ball and who is not! I have not “overturned a century of physics”, I do not need to. The CO2-Global Temperature physics do not give much global warming at all on the increases from now on if you look into it, your theories all rely on feedbacks that are unproven physics. Anyway, I can see that I am wasting my time here, so I will go back to other more positive response threads. Good wishes to you my friend and I hope you find the truth in your future research. I have extensively read a huge huge huge amount of literature on the subject Chris and have through that and own computer modelling come to my strong conclusions after looking very closely at both sides. As I said print what you like, we shall all see in the near future what is happening, I have done my homework well!. Ian: The next obvious step is for you to write up your model results and submit them for publication. That’s what scientists do. 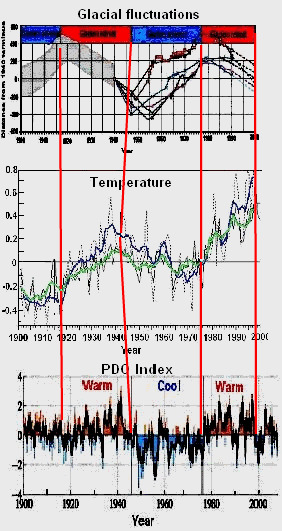 I love his Figure 4 as “proof” that the PDO is controlling temperatures. Especially the bendy vertical line circa 1947. Can anyone really not see a trend in the temperature? The “Glacial Decadal Oscillation” based on the North Cascade Range is pretty wild (and uncorroborated). His claim that “The minute increase of anthropogenic CO2 in the atmosphere (0.008%)” is also wildly misleading. Chris, perhaps you need an additional category in your Crackpot Index for people who only cite their own work. Chris, contrary to your personal opinion, the amount of water vapor in the air, albedo, the lapse rate, etc are not controlled by thermodynamics. They are controlled by _hydrodynamics_. Unfortunately, nobody, including you, have any good enough idea how the highly turbulent masses behave, especially in presence of gravity, rotation, phase transitions under influence of aerosols and soots, all under non-analytical boundary conditions and with spatially distributed heat sources. Alexi is quite right. I’m actually gob-stopped that the author of this blog seems to have never heard about choatic systems, and non-linear dynamics relevant to complexity. That he proposes that we have all the criteria available to correctly predict turbulence is quite unbelievable, but one has become accustomed to these wild claims from GW community. Its this attitude that makes me cringe when i hear the GW fanatics spewing rubbish as if its science. They never learn. On good thing about the recent financial crisis is they will be given far less airtime to unduly panic the public. How succesfully this signal has been reproduced in current climate models? One would guess that before assessing exact values of climate sensitivity to CO2 concentrations, the models must reproduce this basic climate variability. “In science, refuting an accepted belief is celebrated as an advance in knowledge; in religion it is condemned as heresy”. Also, what makes you think that LGM represents a “long-term equilibrium”? A sine wave function also has two almost flat areas, approximately 25% of the whole sine period is about flat (with climatological accuracy). When you see a flat part of sine wave, does it imply that the system has a steady equilibrium point? This is perhaps the oddest statement I have read yet in the climate blogosphere. What do you think the purpose of climatology is? It isn’t just identifying trends. Bob S: Have you a chance to read past my first sentence? Does the “drinking bird” require different “magnitude and sign of forcing and global extent of the anomaly” to produce swings from one state to another? No. It needs only a _constant_ presence of dry air around. Please note the term “constant”, just like the solar flux is near constant. Certainly, you can devote your life to identification of local “forcings” and “anomalies” inside the bird’s glass container, but it will not advance your predictive skill of overall dynamics of the toy. The question was about how the fact of unpredictable atmospheric turbulence is related to predictability of natural climate swings, from long glacials to rapid terminations, and back, and some wiggles in between. The current believe of climatology is that every substantial climate change must have some “identifiable forcing” behind. I am just cluing the student in that this view is highly myopic in the light of modern understanding of nonlinear dynamics of large continuous fluid systems far from equilibrium. In these systems things happen for no apparent reason, and handwaving about elusive “forcings” and “feedbacks” does not explain nor predict much, especially “trends”. I did, but it was unnecessary. You just reaffirmed the quoted section in your most recent post. Central greenland temperature ends 0.095 thousand years before present (1950) thus there’s no recent global warming in the graph since it ends with the LIA. Dear Douglas, your reading of my post seems to be too simplistic. I was talking not about “everything”, but not knowing or paying attention to _major_ effects and concepts. Let me give you another example where not knowing something practically amounts to knowing nothing. As you might be aware, “forcing” effect of a mere 2% change in cloud cover exceeds the whole theoretical “forcing” from 100% change in CO2. Yet the measurements of cloud cover are in very embryonic state, and partially cover only two recent decades. Still the preliminary results indicate that cloud cover (and associated albedo) can change by several percent over few years having major impact on global energy imbalance. Obviously, no such data exist for any climatological timescale; yet climate modelers customary try to compare output of their models to prehistorical/pre-industrial times. Now tell me what should be a crackpotmeter readings for something that failed to account for an effect that has two order of magnitude bigger effect on climate than the effect of trace gas variations? I think the crackpotry index of this activity goes off scale. Ian – 22 year solar cycles – 11min/11max. We get one shot of brutal artic air in a decade and all over the news is the new ice age is upon us. I believe this man your discussing was the one speaking with Lou Dobbs today. I nearly threw up. If solar activity is at a minimum there is less incoming radiation, thus cooler overal tempertures. Simple physics from a Atmos. text book. >This number could be substantially lower if man decides to act on fossil fuel emissions. So your refutation is invalid, as he conceded the same point with ‘CO2 will continue to rise rapidly’. You even post it as the very next sentence. If someone like Lindzen did this, you would be calling for him to lose tenure. The tide has turned on YOU my friend! Now YOU have to defend the “JUNK” science that has been spewing from the mouth’s of supposed “scientists”! We have been scammed scammed scammed!! I was once a “pro man-made” global warming activists. When I went against the grain, it was a lonely place! Now it is people like you, that will get a taste of that loneliness!! The temperature is the same now as in 1940 and sea ice has GROWN 370,000 square miles in the last 2 years! So where is all the warming?? Why isn’t the sea ice continually declining?? Oh, I know, now you’re going to talk about cycles huh?? How convenient!